My favorite poet is Elizabeth Barrett Browning. Her poem “How Do I Love Thee? Let Me Count the Ways….” says it all for me about Global Volunteers in Mexico. The charming, historic town of Querétaro is a “magnet” that keeps drawing me to the people and the volunteering that we do. I’ve been lucky to travel many places in the world, but I’m constantly drawn back to Querétaro. Global Volunteers in Mexico enjoy music, art and architecture in the old city square, just outside the hotel. So, how do I love Querétaro… or better yet… why? First: Our “home base.” We stay in the historic area of the town. So the sights and sounds and smells… yes, the wonderful smells of Mexico… the food… the flowers are all within walking distance. Major attractions are the ornate wooden doors adorning homes and businesses in the historic region of the town. Our charming hotel is a monument all it’s own, as it’s actually the oldest hotel in Querétaro. Sitting in the atrium is like being in your own hacienda… listening to the music and watching as families come to enjoy themselves in this beautiful setting. Entertainment is a block away. The garden is filled with children playing, lovers holding hands, and men selling balloons or polishing shoes. Several nights a week, there is a live band and men and women “dressed to the T” enjoying ball room dancing. It’s truly a soothing, refreshing environment for volunteering as well as recharging your spirit. 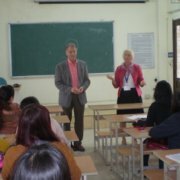 Another reason I love volunteering in Querétaro is our community partner – UTEQ, the Technical University of Querétaro. Students from all walks of life are trained here for a career in technical work or middle management. This is very important, as young men and women are the future leaders of this great country. In a very real way, when we serve in Querétaro, we’re investing in the prosperity and stability of our great southern neighbor. This story epitomizes how well we’re regarded as Global Volunteers in Mexico: On one trip, after I arrived at the Querétaro airport and gathered my suitcases, I approached the customs and immigration line, where a light turns either red or green to indicate whether your bags will be randomly searched. I’ve always gotten green before, but this one time, the light flashed red, which means my luggage is inspected. When the serious young officer was going through my suitcase, he eyed my materials from UTEQ and Global Volunteers. He stopped abruptly and looking up he asked: “Are you a Global Volunteer? Do you volunteer at UTEQ?” When I replied I did, indeed, volunteer at UTEQ, his eyes teared up and he said, “You are why I have this job. The volunteers taught me my English. Thank you so much.” With that, he zipped up my suitcase, and waved me through with a huge smile. That is why I return to Querétaro with Global Volunteers in Mexico year after year. Teaching conversational English in a UTEC classroom. Third, it’s not difficult to teach conversational English in Querétaro. 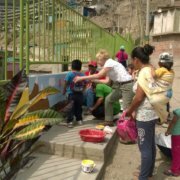 The Global Volunteers program in Mexico is well-established, so our routines are predictable and comfortable. With our Global Volunteers English Teaching Guide, our classroom teaching resources, our student helpers and support from teachers, every team member – regardless of age and experience – makes a big difference. It’s easy to see how much they appreciate every team. One of the hundreds of antique wood doors that distinguish Queretaro, Mexico and draw tourists from all regions. So please join me. It’s a win win-win opportunity. My admiration and respect continues to grow for the teachers who are truly dedicated to their students. I am humbled by the tenacity of the students who often have full time jobs and families and an hour or two on the local bus to attend classes at UTEQ. They feel their education is the path to their future success. It is an honor to be a part of their dreams. At the end of our two weeks, there is always a duel… The teachers and students say they “won” by having our help for two weeks… but we always say we gain more than we gave by serving this wonderful community! Read on for testimonials from two UTEC teachers on volunteers teaching English in Mexico. Learn more about how to volunteer in Mexico.